We took the morning easy by sleeping in a bit and then going to breakfast at the hotel. 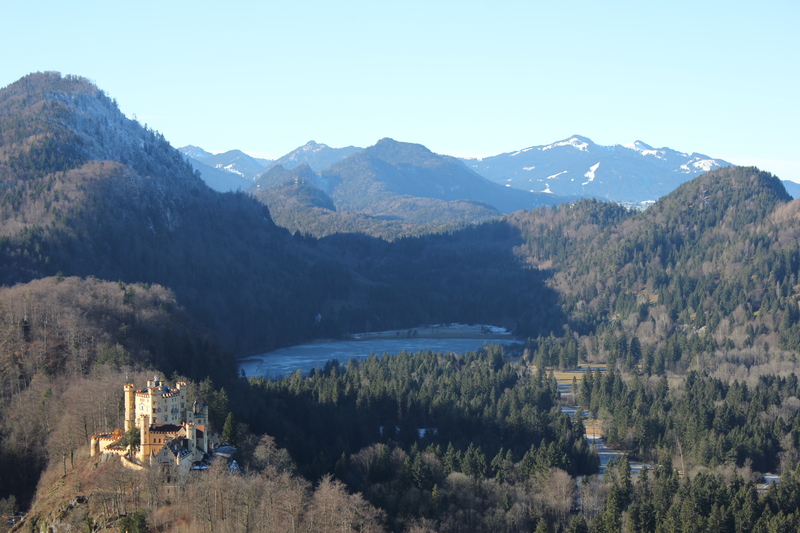 After packing our bags, we went to explore and take pictures of Garmisch-Partenkirchen. We took the train back to Munich later in the morning. Once we arrived in Munich, we checked back in to the same hotel and did a bit of laundry before heading out for the rest of the afternoon. We spent the day at the Deutsches Museum, the largest science and technology museum in the world. We were hoping to grab something to eat before entering the museum, but were only able to grab a piece of a cake from the museum cafe. The Deutsches Museum is very impressive in size. We saw less than half of the museum in the three hours that we were there, but we weren’t even reading the placards very carefully. The museum had a lot of artifacts for each of its domains, but very little hands-on exhibits. It reminded me a lot of a natural history museum, only for technology. One thing we have noticed is that German stores and businesses close promptly at the posted time. The Deutsches Museum closed at 5pm, but at 4:45pm they turned off all of the power for the exhibits and announced that everyone needed to start moving towards the exit. Anyone not moving towards the exit would be escorted by personnel. We noticed a similar thing happening on Christmas Eve when the Christmas markets were closing. The posted closing time essentially means the time that that doors will be locked, lights turned off and employees will be going home. After the museum, we made our way back to the hotel and stopped at Rewe City and Kaufhof for a few grocery items along the way. We also had bratwurst and crepes at the ice skating rink. It was interesting to see that Marienplatz was more decorated for the holidays today than it was on the days leading up to Christmas. We took the opportunity to sleep in today. We had yogurt and princess muesli in our hotel room for breakfast and then packed for our trip to Berlin. We caught the ICE for Berlin shortly before lunch. We bought lunch in the train station to enjoy on the train. Our trip to Berlin was about six hours long. There were very few stops along the way. One of the stops was to allow some sheep to clear the tracks. It’s so amazing how quiet the trains in Germany are in comparison to the U.S. trains. Adam and I were able to watch several episodes of Arrested Development and simply relax along the way. We arrived at the Berlin Hauptbahnhof around 5pm and caught an S-Bahn to take us towards our hotel. We walked through a Christmas market underneath the Kaiser Wilhelm Memorial Church. We were surprised to see that the market was still open, but also very thankful at the same time. After dropping off our bags at the hotel, we went back to the market to grab a bite to eat and to do a little bit of shopping. We got a few gifts for family and friends, and had bratwurst, applesauce langos (a Hungarian deep-fried funnel cake bowl) , and chocolate-covered strawberries. We started our day at the Berlin Zoo and spent most of our day there. We paid for the combo ticket which also got us admission to the aquarium which housed reptiles, amphibians, insects, and fish. The Berlin Zoo is very large, both in terms of area as well as number of species. Adam and I were able to see a lot of species that we had never heard of before, and others that are less common at the other zoos we have been to. My favorite exhibits were the hippos and the sand dune cat. Adam’s favorite exhibit was the seals. We had lunch at the zoo’s cafe which oddly was the most expensive meal we’ve had while in Germany. It was set up a la carte cafeteria style with main entrees, soups, salads, and desserts. Adam had schnitzel and I had soup and salad. After the zoo we went to KaDeWe (Kaufhaus des Westerns — the largest department store in the European continent). The department stores in Germany are very different from the department stores in the U.S. Not only do they have clothing, shoe and home departments, but the also often have toys and electronics, and dining and grocery departments. We spent over an hour browsing the food and dining floor of KaDeWe. It was quite funny when we found the American foods aisle. They had marshmallow fluff, a small bottle of Frank’s Red Hot for over 4 Euros, root beer, chocolate syrup, Campbell’s tomato soup, barbeque sauce, Pepsi, and Pop Tarts as some of the keys items. Some of the brands were ones we had never heard of. After KaDeWe we grabbed dinner at the doener place across from our hotel. We ordered two regular doener, but ended up getting ones without meat. It was disappointing, especially since we were looking forward to having traditional doener kebap on our trip. We woke up bright and early, and were out of the door of our hotel before the sun came up. (This isn’t very hard to do since the sun doesn’t come up until nearly 8:30am.) We caught a bus for the Reichtstag, the building that houses the German parliament. We had an audio tour of the dome and were able to get a 360-degree view of the city from the dome. It was very cold out and the dome was open-air. By the end of our tour, we were very cold. Our initial plan after visiting the Reichtstag was to walk through the Tiergarten. However, because of the cold, and because it seemed as if it would a less interesting walk than we were hoping for, we decided to go to the Berlin Cathedral instead. Before going to the cathedral, we stopped at the Brandenburg gate, which was almost directly across from the Reichtstag. The plaza was being prepared for Sylvestre (New Year’s Eve) celebrations, so unfortunately we weren’t able to walk through the gate or get photos without TV equipment. We paid for a self-guided tour of the cathedral and were quite impressed with the level of information we were able to gain from the tour, as well as the places we were able to go. The tour took us through the sanctuary, choir balcony, and both the inside and outside of the main dome. After our tour, the weather had warmed up significantly. We walked around this area of the city and stopped at a few specialty shops along the way. Adam got a giant pretzel (at least 5 times the size of a normal “giant” pretzel) at a bakery. Then we took the S-Bahn to Alexander Platz where Adam saved me from an oncoming train. We had time to spare and decided to catch a movie at Alexander Platz. We saw the Die Eiskoenigin (Frozen). We were glad that we were able to follow the movie and pick up on most of the dialog. We both found that by the middle of the movie, we had completely forgotten that it was being shown in a foreign language. Once we got back to the area we were staying in, we decided to return to the Christmas market. Nearly all of the shops and restaurants closed early for New Year’s Eve so this was one of the only options we had for grabbing dinner. We tried a waffle with Nutella and whipped cream, and a garlic tomato toasted cheese bread. Adam also had yet another bratwurst. The Christmas market also had a DJ and fireworks shows at 6pm, 8pm, 10pm and midnight. It was very entertaining to hang around the DJ’s stand. It was interesting to hear the music selection with some apparently very well-known German songs (“Er hat ein Knallrotes Gummiboot”) alongside “classic” American wedding dance music (“Macarena”, “Mambo No. 5” and country line dancing). Nearly everyone was moving to the music in some way. Most of the dancers were 40 or older. We returned to our hotel before midnight because it was starting to get cold again and our feet were sore. We certainly did not miss out on the fireworks shows though. Berliners take Sylvestre and fireworks very seriously. All throughout the evening and night, people were launching fireworks from the sidewalks, balconies, and rooftops. The majority of the fireworks were launched at midnight, but some even continued into the morning hours. We were able to see at least three individual fireworks displays from our hotel room. We fell asleep to the booms, bangs and flashes of the rockets.